University of Toronto Press, , 544 p.
One of the great Yiddish scholars of the twentieth century, S.A. Birnbaum (1891–1989) published Yiddish: A Survey and a Grammar in 1979 towards the end of a long and prolific career. Unlike other grammars and study guides for English speakers, Yiddish: A Survey and a Grammar fully describes the Southern Yiddish dialect and pronunciation used today by most native speakers, while also taking into account Northern Yiddish and Standard Yiddish, associated with secularist and academic circles. The book also includes specimens of Yiddish prose and poetic texts spanning eight centuries, sampling Yiddish literature from the medieval to modern eras across its vast European geographic expanse. 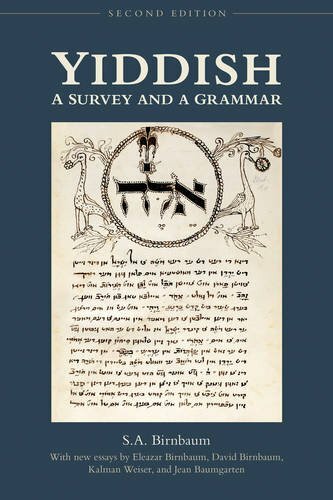 The second edition of Yiddish: A Survey and a Grammar makes this classic text available again to students, teachers, and Yiddish-speakers alike. Featuring three new introductory essays by noted Yiddish scholars, a corrected version of the text, and an expanded and updated bibliography, this book is essential reading for any serious student of Yiddish and its culture.